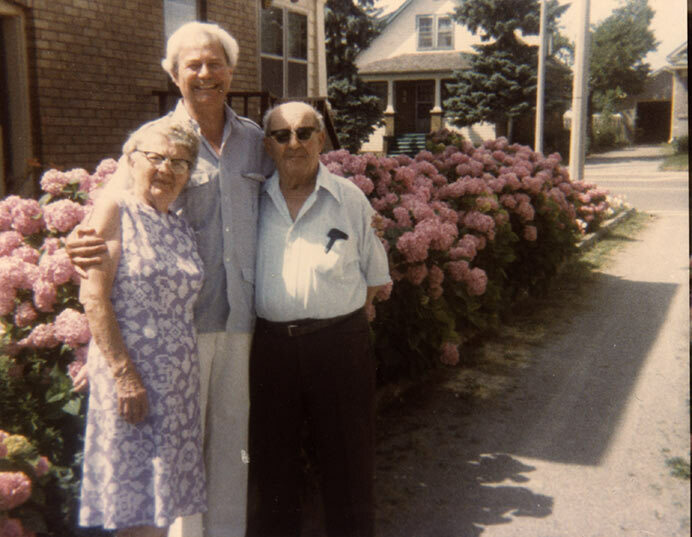 This is a colour snapshot of Eugene Guagneli and his parents Luisa and Arturo Guagneli. During World War II, Eugene was designated an enemy alien and his mother was one of four women imprisoned at Kingston Penitentiary. The family are posing beside a house lined with large pink flowers. Everyone is smiling at the camera. Luisa is standing left-most and leaning against her son. She is wearing a knee length sleeveless dress with a lilac and white floral pattern. Her white hair is pulled back and she has on black framed eyeglasses. Eugene is standing in the center and he has both arms around each of his parents. He is wearing white pants and a short sleeve light blue button shirt with a collar. There are pockets on the front of his shirt. Arturo is wearing dark brown pants, a white short sleeve button shirt with a collar, and dark tinted sunglasses. A sunglasses case peeks out from his shirt chest pocket. The far background shows two houses across the street.